A piece of postal stationery is a stationery item, such as a stamped envelope, letter sheet, postal card, lettercard, aerogram or wrapper, with an imprinted stamp or inscription indicating that a specific rate of postage or related service has been prepaid. It does not, however, include any postcard without a pre-printed stamp. Postal cards are postal stationery and have a printed or embossed indicium and are sold by governmental postal authorities. Some of the forms taken by postal cards include the regular single card, the attached message-reply cards, airmail postal cards, and official postal cards used for official government business with a "penalty for private use". Postcards, on the other hand, is a term used to designate cards prepared by private companies that do not have prepaid franking and readily available at commercial outlets. They are frequently illustrated with pictures or printed advertisements. They are generally not considered postal stationery. The image of the stamp appears to be Portrait of Queen Victoria. The text and indicium1 are in carmine. 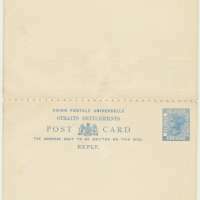 The indicium1 shows the value of 3 cents, each for Post Card and Reply Card. The backside of each card appears to be blank. During this time, Straits Settlements are based on Spanish American Dollar, where $1 = 100 cents. Interchangably in contemporary Malay Language, Dollar was known as Ringgit whilst cent was known as sen.
During this time, Straits Settlements was British Crown Colony and consisted of Penang Island (and Province Wellesley), Malacca and Singapore. The card's sign of age is evident but still not that bad. Probably from tropical climate. More information needed about the printer, method of printing. 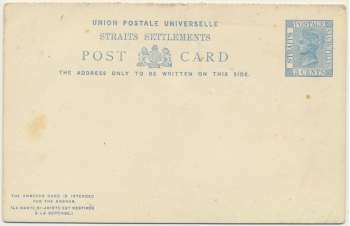 Standard Catalog of Malaysia, Singapore & Brunei - Revenue Stamps & Postal Stationery. 1. indicium - An indication, sign, or token - specifically, the stamp on mail indicating paid postage.